Doing a TED talk is very anxiety-inducing. You have to stand in front of people like Al Gore and Bill Gates. Plus people keep telling you it’s the most important 18 minutes of your life. Jon Ronson: Strange answers to the psychopath test In my year, 2012, Susan Cain was doing her introvert talk and everyone kept saying, “Oh she’s so brave giving a TED talk when she’s an introvert.” But when I was chatting with Susan Cain backstage, I was the one so nervous and fidgety I destroyed my TED ID badge. It exploded in my hands. Whereas Susan Cain was just fine. I worried what the stress of being at TED might do to Eleanor, given her previous mental health problems. But it’s six months later and Eleanor’s TED talk has just gone online, and TED has published a book called Learning from the Voices in My Head to go alongside it. Eleanor Longden: The voices in my head They asked me to do an email Q&A with Eleanor. The entirety of the conversation can be found on The Guardian’s website; or read short excerpts from it below. I started by asking Eleanor about how she handled the stress. Eleanor Longden: Yes, [I was] definitely very nervous in the run-up. In fact, the day of the talk itself was agony — like waiting to take an exam in front of a colossal audience. I was never worried that it would have a severe impact on me, though. In fact, having experienced such serious difficulties in the past has probably given me very useful skills in managing emotion and taking care of myself, more than I most likely would have had if the breakdown had never happened. Jon Ronson: Let’s back up a minute and talk about what happened to you. Whenever I tell anyone your story, I always begin with a bit of a narrative flourish: You are just a regular student somewhere in England. And then one day you got out of bed and … what happened? Eleanor Longden: Well, essentially what happened was that — although I couldn’t possibly have known it at the time — my whole life, and the life I’d expected to have, was about to change beyond all recognition. This brewing catastrophe began in a relatively mundane way; the appearance of a single, neutral voice that calmly narrated what I was doing in the third person: “She is going to a lecture,” “She is leaving the building.” I was startled at first — very shaken. It was quite a weird sensation. But I got accustomed to it pretty quickly, because it was so unthreatening. I knew what voice hearing was, of course, but this didn’t seem anything like the types of voices you read about in the media or see in films — frenzied, violent voices that drove people to acts of destruction. And after a while, I even began to find it quite reassuring. Owing to a series of childhood traumas, I was a very confused, anxious and unhappy teenager, and the voice started to feel like a reminder that in the midst of crushing unhappiness and self-doubt, I was still carrying on with my life and responsibilities. I wondered whether other people had similar commentaries but just never talked about it. Also, although this took a bit longer, I began to feel that the voice was very closely connected to my sense of self, in that it reflected emotions I couldn’t express. So, for example, if I felt angry and had to hide it, then the voice would sound frustrated. It began to seem vaguely fascinating, creative even — how my emotional world was being externalized through this voice. Jon Ronson: So this story is about to get hugely worse. But before it does, let me ask a question. I remember when I was a kid once or twice hearing a kind of weird babble of voices in my head. Like there was a party going on and a whole bunch of people were all talking at once, and I couldn’t make out what anyone was saying. It didn’t bother me at all. I think a lot of people have had a similar experience: hearing a voice just as they’re falling asleep, or whatever. Before everything got worse for you, is that the kind of thing we’re talking about? Something as innocuous as that? 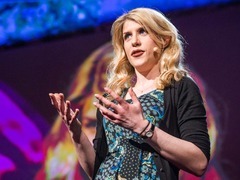 Eleanor Longden: That’s a really interesting question, because what research actually suggests is that voice hearing (and other unusual experiences, including so-called delusional beliefs) are surprisingly common in the general population. The recognition of this had led to the popularity of “continuum models” of mental health, which suggests different traits and experiences are all part of human variation — not strictly categorical in terms of “us and them,” “sane and insane,” “normal and abnormal.” However, I do think life events play a vital role in determining who becomes distressed and overwhelmed and who doesn’t. This might include experiences of abuse, trauma, inequality, powerlessness, and so on, but it can also include the immediate reactions of the people around you. If you don’t have people who will accommodate your experiences, support you, and help you make sense of what’s happening, then you’re much more likely to struggle. Jon Ronson: So when did you first notice that the voices were becoming less threatening? Can you remember a moment when the voices became noticeably nicer? 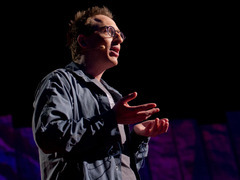 Jon Ronson: When was the very last voice that you heard?